I know too many people who keep quiet about politics and social justice because they’re afraid they’ll say the wrong thing and offend somebody. I bet you know people like that too. And I’m not an expert on this stuff. I don’t always have the right language to dive into the tough topics that dominate my news feed. But I do have Google, and the determination to find reliable and diverse voices who are already writing about issues that the rest of us need to understand so badly. But in this comic, Robot Hugs makes a great point about how tone policing protects privilege — and silences people who are hurting. This is no way to get justice, and this breakdown will help you understand exactly why. Tone policing is when members of majority groups focus on the language and perceived emotion of marginalised or underrepresented groups during discussions of inequality. The majority group sees themselves as entitled to infer “illegitimate” arguments based solely on the words being used, rather than the meaning of what is being said. This is an attempt to silence or derail discussions, to shift power away from the lived experiences and knowledge of minorities or disempowered groups. If White people can’t handle POC talking about racism, it doesn’t matter what words we use; the issue you have is that we’re talking at all. It’s striking; whether it’s my blog, my Twitter, or when I’m interviewed — people say they want to hear “positive” language on racism. Why? There’s no “nice” way to talk about racism. Racism is structural; it envelops us; it ruins the life chances of POC. There’s nothing “positive” about racial inequality. White people who imagine there’s a “rational” way they deem acceptable to hear discussion of racism is actually them saying they want to dictate how POC express their lived experiences and knowledge of racial oppression. As POC point out all day, every day, White people put more effort into policing discussion of race so they don’t have to work on themselves. If White people take offence over how POC talk about racism, but actively dismantling racism is not a concern, then they’re part of the problem. White people don’t get to subjectively define racism; they don’t get to silence POC’s suffering and experiences of race. That’s White supremacy. If people want to be uplifting and positive all the time they are welcome to do that — it doesn’t work for me. I don’t think it’s realistic or healthy to suggest that we should be disappointed in anyone who doesn’t meet marginalization, discrimination, and disenfranchisement with uplifted politeness — acting like it’s all fluffy bunnies and rainbows. You are allowed to do that, but you are not obligated, no matter what the tone police say. If you look at the oppression that goes on in the world and it makes you angry, I don’t think that’s surprising and I don’t think it’s a bad thing. The more we step out as activists, the more we call out the behavior around us that is seriously messed up, the more we express our anger about it, the more people will become uncomfortable. We are not responsible for other people’s feelings or for being activists on other people’s terms. A possible side-effect of tone policing is a total lack of emotionality in regards to a statement what should elicit an emotional response. Sounding emotionally detached all the time like a sociopath doesn’t work either. When you lack basic emotionality, your statement registers as not important enough to consider. Remember, the objective is to silence you, so if you totally lack emotion you’re damn near close to true silence. A takeaway here is the understanding that anger is justified when it is in response to oppression and oppressive tactics. When someone questions anger instead of addressing the issues raised, they are telling you — the marginalized — that you have a responsibility to make them comfortable at all times, as well as stating the facts. White comfort doesn’t trump black lives. Black people live in the “discomfort” of white supremacy their whole lives, and white people get upset when facts on the matter are mentioned? No. Stop. You don’t have to coddle feelings of the colonizer, especially if you are of the colonized, marginalized group. Good is not nice. Nice is only nice enough to ignore. So go read all of these! 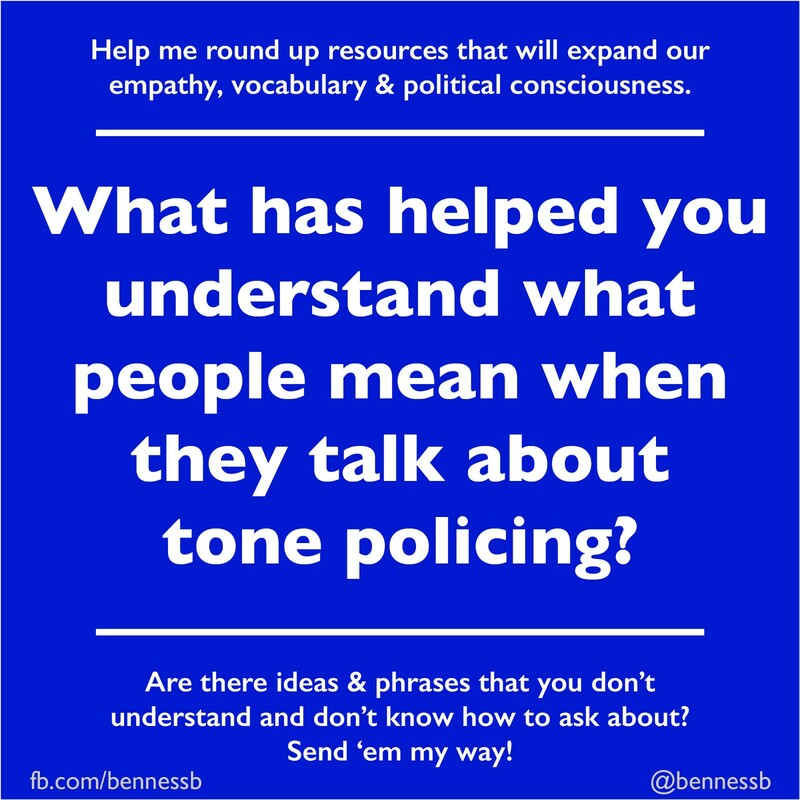 And let me know what has helped you understand tone policing (links and powerful quotes also appreciated). For more roundups, check out my main list of stories. And if you found this helpful, I’d appreciate a clap! Host of No End In Sight, a podcast about building a life with chronic illness. Designer at Digital Artisanal Modern X Stitch. She/Her. Procedural TV Enthusiast.